More than 90% of non-institutionalized people over the age of 65 in the United States receive health insurance through Medicare. (1) Of the money Medicare spends on individuals, it spends nearly one quarter in the final year of one’s life, and the majority of that money is spent on hospitalizations.2,3 With much talk during this election season about entitlement reform and the looming bankruptcy of Medicare, a study recently published in The Journal of Palliative Medicine is of particular interest, offering insight on how Medicare could save money by focusing on end-of-life care at home. Dana Lustbader and colleagues conducted a retrospective study, comparing costs of care and resource utilization during the final year of life for patients who were enrolled in a home based palliative care program, and those who received usual care. All patients included in this study received their care from ProHEALTH Care (a multispecialty physician practice in the New York metropolitan area), died between October 1, 2014 and March 31, 2016, and had 12 months of continuous Medicare claims data prior to their death. Lastly, they found that being on Home Based Palliative Care was associated with a very high likelihood of dying at home (87%) as compared with a national rate of 24% for all Medicare beneficiaries. Nearly 90% of adults say that they would prefer to receive end-of-life care in their homes if they were terminally ill, yet only a small proportion of Medicare beneficiaries die in their homes. 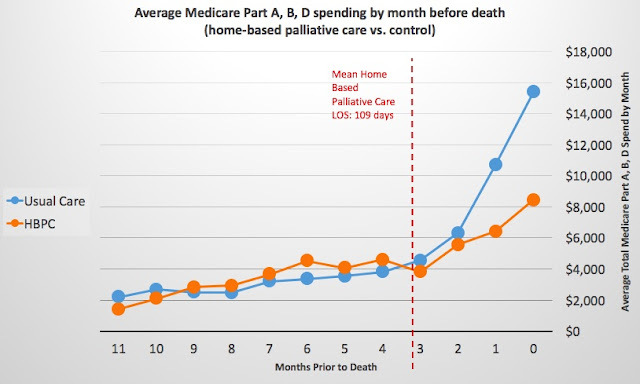 (2,4) This study shows that a home-based palliative care program can decrease unwanted hospitalizations, increase the chances of dying in one’s home, and improve utilization of hospice services, all with a significant savings in cost. Hospital-based palliative care programs have been growing rapidly across the country, largely due to the mounting evidence of improved quality and costs savings. Maybe it is time we focus some of those expansion efforts on providing care for patients where they actually want it – in their homes. Joan M. Teno et al., “Change in End-of-Life Care for Medicare Beneficiaries,” JAMA 2013;309(5):470-77. And who is providing most of the care at home? Probably unpaid family caregivers. Yet they are not mentioned as needing training and support for a grueling(and maybe rewarding) responsibility. Are the costs to them calculated in terms of mental and physical health, lost income, extra bills?